Rigwarl, the Bristleback, is an extremely durable strength hero blessed with a passive damage reduction ability and active abilities that have low cooldowns. Thanks to his signature passive (which takes his name as its own), he is able to soak up massive amounts of damage from his back and his sides. He leverages his natural tankiness in order to deal damage with Quill Spray, which shoots spikes from his back out in a moderately-sized radius. The quills themselves stack with consecutive casts, dealing more damage with each stack on a unit. Left alone, Quill Spray can gradually turn the tide of a lengthy engagement, which Bristleback absolutely relishes. His Viscous Nasal Goo functions in much the same way, at least in terms of its ability to stack on targets. With every stack, the target moves slower and has less armor, opening them up to further damage. Without Viscous Nasal Goo, it would be ridiculously easy to kite Bristleback, who himself has below average base movement speed. Other than his goo, however, there exists his ultimate ability Warpath, which gives Bristleback additional attack damage and movement speed depending on how many spells he has cast in the last few seconds. If he is given the opportunity to unleash his low-cooldown abilities in a teamfight, Bristleback can turn into an additional carry thanks to the benefits of Warpath. While all this makes him seem like an unstoppable juggernaut of a hero, he does have exploitable weaknesses. As a very focused strength hero, his mana pool is very lacking—which is to his detriment considering that his two active abilities eat up quite a bit of mana after a few uses. This also makes him vulnerable to heroes with mana burn, mana break, and mana drain abilities, particularly in the laning phase when Bristleback doesn’t have any items to boost his maximum mana yet. The hardest counter to him, though, is the Break mechanic, which completely disables Bristleback and Warpath. The item Silver Edge, and Viper’s ability Nethertoxin both do this, which make them good picks against him. Despite his shortcomings, though, there is always a place for Bristleback in aggressive compositions. His durability allows him to dive towers early on, and completely destroy trilane strategies without breaking much of a sweat. If you need a hardened fighter in your ranks, consider none other than Rigwarl himself. As someone who is very typically played in the offlane, Bristleback’s skill build is pretty much set in stone in every game. The first ability that one should max out is Quill Spray, in order to maximize its damage as soon as possible. Keep in mind that Quill Spray has a fixed mana cost of 35 per cast—which means that once it hits max level it has incredible mana efficiency. It can also be used to farm creep stacks, thanks to its stacking nature and synergy with Bristleback’s passive. Speaking of which, Bristleback (as in the ability) should come second in the order. Getting it early makes you a lot harder to take down, especially in the mid game when the enemy team is not likely to have Silver Edges just yet. That said, a single value point in Viscous Nasal Goo at Level 7 is a good investment, as that is around the time when you and your team should be gearing up to get aggressive on the map. Warpath, of course, should be taken at every given opportunity. Because Bristleback does more damage the more he is able to cast Quill Spray, itemizing for survivability is key. Most of his core items revolve around increasing his health, armor, or adding more layers of damage reduction on top of his already formidable defense. To that end, your first item will typically be Vanguard, which is built from Ring of Health—one of the best items you can buy for surviving the laning phase. Bristleback is a melee hero, after all, which means that he will have to tank a lot of harassment in the early game. Vanguard’s damage block, additional health, and bonus regeneration all help in this regard. Once you obtain a Vanguard, you can pretty much start participating in teamfights. Carry a Town Portal Scroll with you at all times, so that you can respond to threats and tower dives alike when they arise, and create space for your position 1 and 2 cores by going for gank attempts of your own. You’ll want to use the gold that you get from these engagements to build utility items for your team, such as Pipe of Insight against heavy magic damage, Crimson Guard versus physical attacks, or Spirit Vessel versus heroes that rely on regeneration. These items will make you and your team that much better. Going into the late game, choices for luxury items will include either more utility, or ways to deal more physical damage. Shiva’s Guard is a great pickup for when you really need to annoy the enemy team, thanks to the potent movement speed and attack speed slows that the item provides. 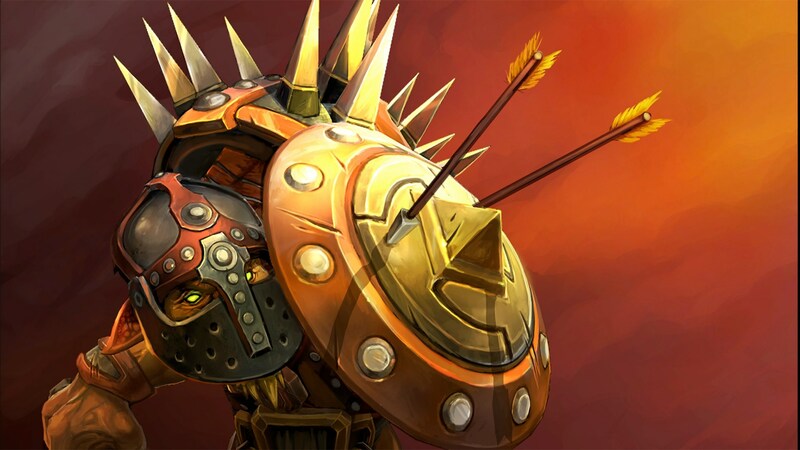 Assault Cuirass is also a good choice, as it lowers the enemy team’s armor (thus allowing you to deal more damage with Quill Spray) while pumping up your team’s armor. The bonus attack speed is the icing on the cake, giving you a nice DPS boost when you’re all Warpath’d up. You might also want to consider purchasing an Octarine Core, which will significantly reduce your cooldowns and feed you more Warpath stacks. Bristleback’s rotation in teamfights is one of the simplest in all of Dota 2, thanks in no small part to having only two active abilities. It’s more a matter of going back and forth between his two skills, making sure to use them as soon as they’re off cooldown. You’ll of course want to initiate with Viscous Nasal Goo, in order to slow the target down and give your teammates time to position themselves and/or catch up. Follow up with Quill Spray to start applying stacks, and use your Warpath charges to stay within striking distance of your target. And that’s it, really. Rinse and repeat until your target is dead, then move onto the next one. Ideally you’ll want to go after the supports first, then the tankier heroes on the enemy team. As mentioned in the intro to this guide, Bristleback’s dependence on mana means that he is susceptible to mechanics that remove mana from his mana pool. Anti-Mage, Nyx Assassin, Lion, Weaver with his mana break talent, Keeper of the Light, and Diffusal Blade carriers can quickly divest him of his mana such that he is unable to rapidly cast his spells. Also, Break is an important thing to have against Bristleback. By temporarily disabling his passives, you and your team have a much better chance of taking him down thanks to the lack of damage reduction on his end. Conversely, it is also a good idea to build armor against Bristleback, in order to reduce the impact of his Quill Spray. Ironically, Assault Cuirass is a good item to purchase when going up against him, despite it being one of his endgame items of choice.